With these opening lines of one of Tom Waits’ poems, Stewart D’Arrietta pounds more than nails into a hardwood floor at the German Club, he pounds on his heart, he pounds on his piano, and he pounds on the stage. From Stewart’s virtuoso band members on double bass, guitar, and drums, to the sound engineers who have perfected EVERYTHING, Belly Of A Drunken Piano delivers a clear, loud, powerful sound that made me quiver to the core. There were moments in this concert in which every single “Waitsian” planet was aligned and all the world was green. We had that sweet cacophony of petrified souls wailing for release from the sulphorous pits of hell, which is what Tom Waits conjures when he is in full flight. This was balanced by the sepia-toned pathos of some of Tom’s more reflective songs. And then we got the snarling, winking poetry, often accompanied by a driving base snaking around the twists and turns of exquisite word play. But, for this reviewer, everything fell into place when we got the song that such a show demands, The Piano Has Been Drinking. 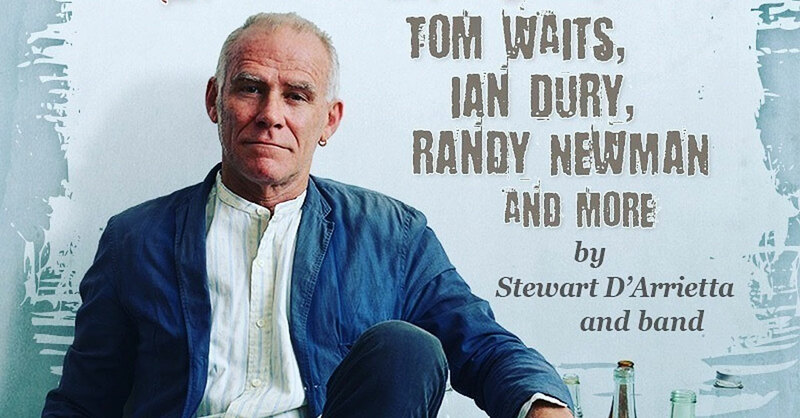 Not only is this song the epitome of drunken-bellied pianos, it brought into focus the reverence Stewart shows towards the poetry and lyrics of Tom Waits. 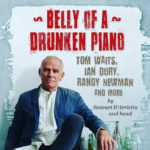 If you’re looking for the heart of Tom Waits, you’ll find it in Belly Of A Drunken Piano. It’s worth stealing a dollar from your mama’s purse to be present when Stewart D’Arriatta takes the stage, puts his foot to the floor, and barrels down the boulevard of Tom Waits’ songs. There is plenty of ebb and flow in the set list, as Stewart weaves in songs by Randy Newman, Ian Dury, and others, but then includes some of his own. And these originals fit the set perfectly. From his Little Bit Of Satan In Us All to the anti-war anthem, War Is Ever, it was a pleasant surprise to become more acquainted with the man many of us have only met through his masterful interpretations of Cohen and Waits. If you enjoy rich, tapestried song lyrics (that you can hear) with smooth, tight, musicianship, you’ll understand why I’ve paraphrased one of the most sublime songs in this show (Invitation To The Blues) as my way of compelling you to make time for 90 minutes of emotional power. And you can eat here every night, what the hell have you got to lose?